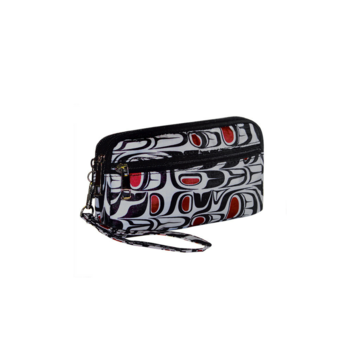 Native Apparel Coastal Traveler Organizer Clutch. Three styles to choose from. SKU: N/A. 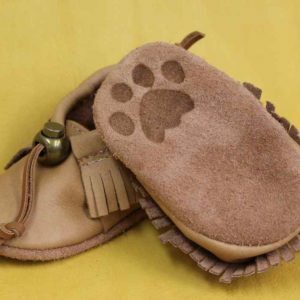 Availability: In stock Shipping Weight: 0.25 kg Category: Wallets / Bags. Tags: Wallets / Bags. 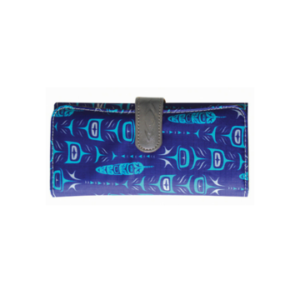 Streamline your make-up case with this Native Apparel Coastal Traveler Organizer Clutch. 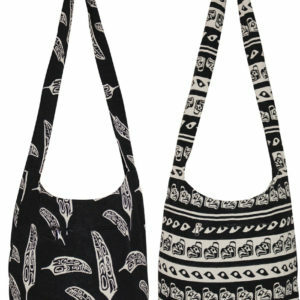 Matching crossbody bag and wallet available. 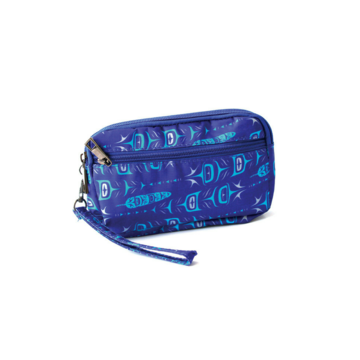 A versatile organizer with a zippered pocket on the outside and two large zippered compartments inside. 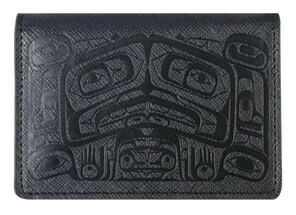 Coastal Traveler Wallet by Native Northwest Available in three designs. 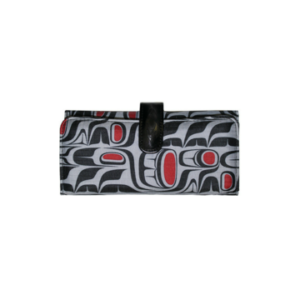 With durable construction, this wallet can hold multiple cards, and features an ID pocket and billfold. 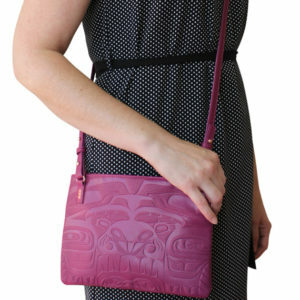 Our animal-friendly, vegan leather Embossed Fashion Bags are equipped with an adjustable should strap and interior pockets, featuring the artwork of Haida artist, Ernest Swanson. 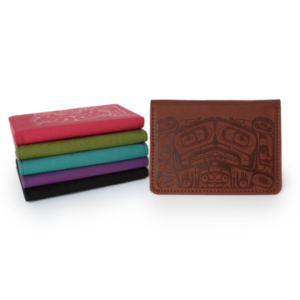 Our Native Origins Card Wallets are compact enough to travel with you anywhere. Available in six great colours sure to please anyone. 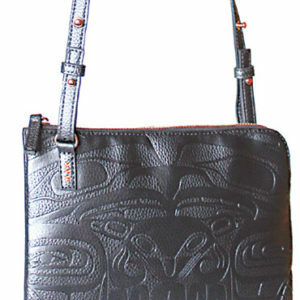 Featuring Raven Box by Haida artist, Allan Weir. 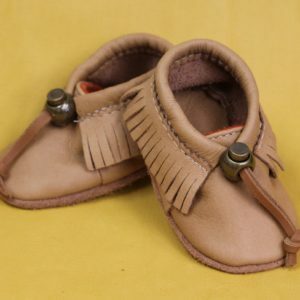 Available in six colours: black, brown, green, pink, purple and teal. Faux leather, 100% polyurethane; 4" x 3". 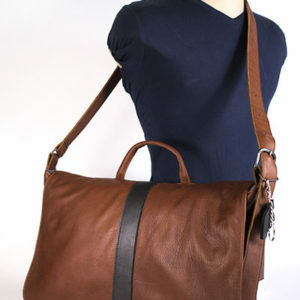 This large messenger bag is made of genuine buffalo hide leather. 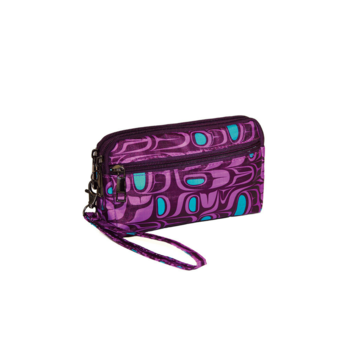 It has a durable inner lining, and an inner pocket that will fit a small tablet (6x8 inches). 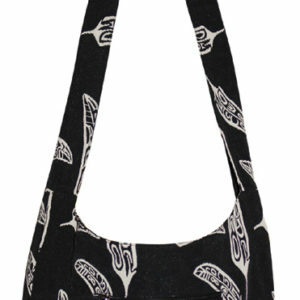 The strap is adjustable, and the fold over flap has magnetic snap closures. Cork brown with black stripe. Dimensions: 12 x 18 inches.